Clary Sage, along with other herbs, was cooked in lard, cooled and then used as an ointment to soothe and calm the skin to treat skin blemishes, acne, and infections. Clary Sage offers many bio-active components that offer anti-inflammatory, anti-bacterial, and anti-aging properties for supporting healthy skin and hair care. With its astringent and antiseptic properties, Clary Sage can be used in deodorants and is beneficial for balancing excessive sebum development (oil secretions) in skin and hair care preparations. It can be used to control greasy hair and dandruff and to fight off premature balding by stimulating hair growth. 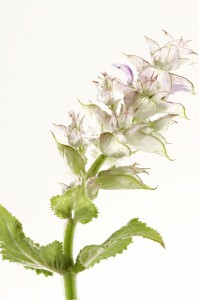 Historically, Clary Sage supports the immune, respiratory, and digestive systems. It also was used to calm muscle spasms and to reduce skin irritation and inflammation. Clary Sage oil helps balance the extremes of emotions and restores emotional equilibrium. Clary sage, used aromatically and topically, can be used for its antidepressant, anti-stress, digestive and sedative properties. It is noted that for both men and women, Clary Sage brings more awareness of their feminine qualities and may also help to relieve menstrual pain and premenstrual problems in women. Because of its estrogen-stimulating action, Clary sage is most effective when levels of this hormone are low. This herb can help relieve complaints associated with menopause, particularly hot flashes, through balancing mood and reviving sexual desire for women during this life change. Clary Sage oil and extracts should not be used by women who are pregnant or nursing. Clary Sage Essential Oil should be diluted before use.